IS THE STAFFIE THE TRUE BULLDOG? 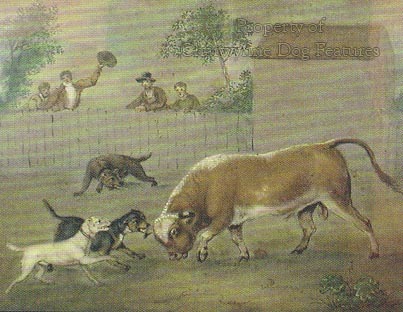 We have to rely on old animal paintings and prints to discover what the bull-baiting dogs looked like. 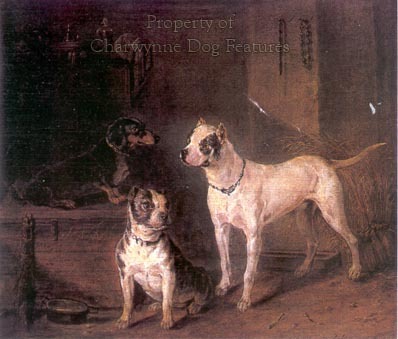 The brutal pursuit was banned in 1835 but the artistic depictions of before that time show a strong-headed, powerfully-muscled, very agile dog so much more like the early Staffordshire Bull Terriers than the Bulldog of Victorian times. The advent of dog shows led to alarming exaggerations in the breed of Bulldog: flat-faces, absurdly undershot jaws, undue 'spread' between the front legs and a pear-shaped body, when seen from above - all of which did nothing for what had been a 'gripping' breed. Every time a breed of dog is exaggerated in anatomy by misguided fanciers (and cruel ones too - devices were fitted to Bulldogs' jaws to prevent the natural growth of the jaw) it is, in time, doomed. One breeder boasted of having bred the flattest-faced Bulldog in London! Baiting in the country was alleged to be based on the need to tenderize the beef before slaughter, and the dogs used were cattle-pinning dogs owned by butchers. In towns, it was more of a public spectacle in times when cruelty to animals was, sadly, regarded very differently. Bull-baiting was practised in other countries too. In Spain, 'gripping and holding' breeds like the Alano, the Canary Dog and some of the cattle-seizing breeds in the Balearic Islands were utilised. The Canary Dog is known there as the Perro de Presa Canario or gripping and holding dog, rather as the Filas, with the same translation, were used offshore in the Portuguese islands, as the Fila de Sao Miguel demonstrates. 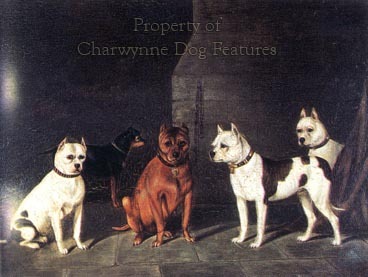 The renowned Victorian dog-dealer and Bulldog breeder Bill George imported some Spanish Bulldogs and used them in his breeding plans. All these dogs were strong-headed but none were flat-faced. Muzzle-less Bulldogs were a show ring imposition and with such a handicap could never have seized and held a bull. But what physical attributes did the baiting dogs need? To survive, let alone succeed, they had to be immensely powerful in the muzzle or the bull could throw them off and gore them to an early grave. To survive too, and more dogs died in the baiting rings than bulls, they relied on great agility. If you have seen a Spanish bull-fight, you will have witnessed at once a massive bovine athlete, amazingly fast over short distances, remarkably quick-footed, unbelievably determined when enraged and famous for the dextrous use of its life-threatening horns. When I had overall management responsibility for a Rare Breeds farm, I used to study both the long and the shorthorn bulls, most admirable, impressive creatures - even when relaxed - and try to visualize them, desperately fighting off powerful, recklessly-brave dogs; I was left with admiration for both, NOT for the activity but for the astonishing courage of both baiter and baited. When I see dogs bearing the breed title of Bulldog in the show rings of today, I just shake my head in sadness and regret, not because of the loss of the disgusting so-called 'sport' of bull-baiting but for the loss of true type in the breed with this name. The Bulldogs of the show ring just do not merit their breed title. If you look at Staffies, especially muscular, fit, strong-headed ones, you are seeing real signs of the old bulldogs: great agility, incredible speed over short distances, broad-heads with powerful jaws, feistiness but with control, determined characters - willing to persevere (although nowadays this is looked on unfavourably by the so-called experts on dangerous dogs in both the Met and the RSPCA, knowingly confusing an admirable quality with a savage one). The construction of the jaws of all the bull terrier breeds, from the misjudged Pit Bull to the American Staffordshire Terrier and our own Bull Terrier, show a wide mouth and an even bite, with strong development in the masseter muscle. They display a balanced muzzle, showing width and length. Our pedigree Bulldogs have restricted breathing and no means of gripping with strength. The wording of their respective breed standards tells a story in itself. For a century our Bulldog had to feature: a face that was short, a muzzle that was short, jaws that were broad, massive and square, with the lower jaw projecting considerably in front of upper and turning up - in other words, a dog with an unnatural head! 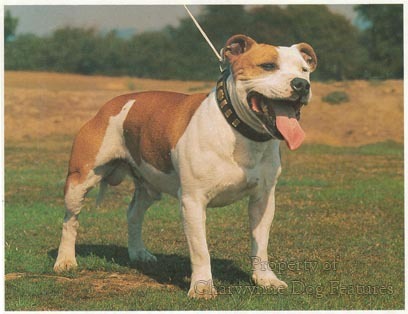 In stark contrast, our Staffordshire Bull Terrier is expected to have a mouth that is strong-jawed, with tight clean lips, large teeth and featuring a perfect, regular and complete scissor bite. That's a good start for a gripping breed! Its movement has to be free, powerful and agile with discernible drive from the back. 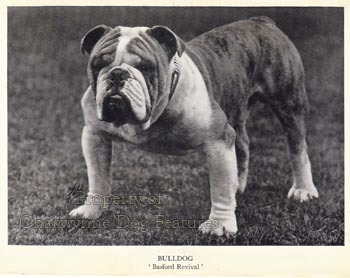 Until recently, the Bulldog had to move in a "peculiarly heavy and constrained way" with one shoulder leading. Which of these two breeds would survive in a bull-ring? 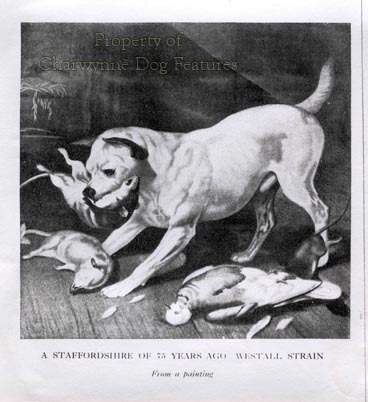 I believe it perfectly reasonable to consider the Staffie as the contemporary example of a bulldog and am saddened that we can no longer view the pedigree Bulldog as the sporting breed it once was. For the English Bulldog to lose its claim on its own breed title is more than a shame, it's a tragedy.